For a Catalyst equipped engine, Misfires can be expensive. If a misfire occurs, the unburned fuel and air mixture is pumped by the exhaust stoke into the catalyst, where it washes over the advanced coating on the catalyst honeycomb. The next blast of hot gas then ignites the mixture, driving up the catalyst temperature by as much as 800ºC and causing a marked deterioration in the catalyst, so that severe catalyst damage can occur very quickly. It is for this reason that the Fuel rail turns off after only four seconds on starting if the engine has not fired - it prevents unburned fuel being pumped into the exhaust. For the purpose of OBD there are two types of Misfire - Type A, where a catalyst is considered to be endangered, and Type B, where damage is borderline. The Misfire monitor on the Scorpio is entirely in software. Distributor engines use Knock sensors, but these are not required for the EECV equipped vehicles. Because misfires can very quickly cause severe damage to the catalysts and directly effects pollution levels, the MISFIRE Monitor runs constantly, all the time the engine is running. 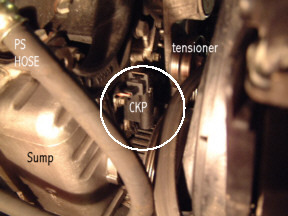 The PCM calculates the rotational velocity of the crankshaft using the toothed wheel on the front of the crankshaft and the CKP sensor (timing a tooth missing at 90º BTDC gives the acceleration produced by each cylinder at a firing event) and from this the individual deviant cylinder velocity can be calculated. This Low Data Rate signal can then be evaluated by the Generic Misfire Algorithm Processing. Some versions of the EECV can 'learn' inaccuracies in the Crankshaft Position toothed wheel which may affect the accuracy of the data processing. On these versions, the MISFIRE Monitor is disabled until the PCM has learned the correct profile of the toothed wheel. This requires two 60mph to 40 mph decels with no braking for the profile to be learned and stored in KAM (keep alive memory). This profile is lost on battery disconnect and must be re-learned again on subsequent reconnection. The acceleration a piston undergoes during a firing event is directly proportionate to the amount of torque it develops. A piston which is not subjected to a firing event will be 'dragged' round the power stroke instead of being 'fired' round it, and the rotational speed during this misfire will be slower than a satisfactory power stroke. The calculated piston acceleration value is compared to a misfire threshold that is continuously adjusted based on inferred engine torque. The processing is then evaluated for noise. A misfire produces an assymetrical cylinder motion, while mechanical noise (driving over rough roads or high rpm/light load conditions) are symmetrical piston motion. Simply put, mechanical noise is where the firing stroke has taken place but the piston movement has been affected by 'snatching' on the transmission. Thus, deviant cylinder events of the symmetrical type are removed from the calculation and it is only the noise-free deviant accelerations which are labelled as misfires. These misfires are then counted over a continuous 200 and 1000 revolution period. At the end of each period, the misfire rate for each cylinder is computed and compared to a engine/load threshold table in ROM. If the misfire rate exceeds this threshold on the 200 revolutions period and the PCM computes a risk of immediate damage to the washcoat in the Catalyst, this is a Type A misfire. In a MIL equipped vehicle the MIL light will flash while the misfire is occurring and the MIL light will illuminate at a subsequent event, and a DTC is stored. For the Scorpio there is no MIL light. On 6 cylinders engines the EECV may be able to disable the INJector to the affected cylinder, but this is not available to the 4 cylinder engines. Next, the Misfire rate is calculated for the 1000 revolutions period and compared to another table of emission-threshold values to give a Type B misfire rate for any cylinder. The Misfire Monitor runs continuously, calculating misfires every 200 and 1000 engine revolutions. Type A - Catalyst Damaging misfire threshold is an rpm/load table varying from 40% misfire rate at Idle to 4% at high rpm and loads. If the Monitor detects random deviant cylinder events without a regular culprit, the P0300 code is stored. Check connections to the electronic distributor/spark packs. DOHC vehicle in particular have a vulnerability in the Fuel Cut Off loom (which wires the two coil packs under the centre cylinder cover). 24Vs have a separate electronic distributor at the front of Bank 1 - check the connections to this - since the fault is truly random it is more likely that the cause is to be found here. security/condition of the ignition lead(s) Make sure the lead is not cracked/split or chafing. The lead should show a 20K ohm approx resistance. Excessive resistance or open shows a fault. Condition of spark plug. Check for broken/burned electrode, cracked ceramic body, excessive burning or contamination. Check grade is correct. Replace as necessary. The INJectors have their own trouble codes for shorts or loss of pressure, so do not necessarily suspect the INJector unless these Trouble Codes are also recorded. Misfires can also be caused by air leaks in the egr system or in the Inlet system, leaning out the mixture which becomes too lean to fire.